Americans love their coffee but do you love it enough to try Death Wish Coffee, the world’s strongest java? This insanely strong coffee is heavily roasted, highly caffeinated and very flavorful. Also fair-trade and organic coffee beans so I guess that makes it good for you…or maybe not. With per 728 mg of caffeine per 12 fl. oz cup, this super-charged coffee is only for those who have a very tolerance for the stimulating effects of caffeine. Made purely of special high caffeine Robusta coffee beans, this is the strongest coffee in the world right now. Not for the timid (or those with heart tremors). Read the many and often hilarious reviews of Death Wish Coffee here. Fireglass — Ice on Fire! Fireglass dramatically changes your fireplace or fire pit. Replace dirty and tired looking burning logs, lava rocks or coal with elegant fireglass and completely transform the look of any living room with a fireplace or outdoor fire area. Fireglass is pure tempered glass polished to sparkle like diamonds with flames dancing across them. It’s not just about beauty and elegance though. Fireglass like this produces much more heat with the same amount of gas and absorbs and radiates it better than any of the older methods like fire stones or ceramic logs. It is made to withstand very high temperatures, doesn’t change no matter how much you heat it and never needs to be replenished or replaced. Unlike coal or wood, fireglass produces no harmful or polluting emissions, there are no ashes to clean up and it looks great whether the fire is on or not. Transform your tired old fireplace or fire pit into an attention grabbing decorative feature with new fireglass. It comes in a great variety of colors and you can read people’s reviews and see pictures of fireglass in their homes here. For something really different, you can also create vivid colored flames in your firepit with these rainbow flame crystals. The Lil’ Holster clings securely to virtually any smooth surface and is the perfect storage solution for all those smaller things that usually end up lost or a mess. Use it in the shower for razors and toiletries; in the bathroom for brushes, makeup, toothbrushes and toothpaste; in the kitchen beside the sink; off your desk at work; at the front door for keys; just about anywhere you’d like to keep frequently used small objects tidy yet at easy arm’s reach. The Lil’ Holster comes in a rainbow of colors, is made of tough and durable silicone and has holes in the bottom to drain water and keep everything dry and ready to use. A fun and stylish new way to keep track of all the little things in life available at Amazon now. This handy can strainer quickly drains all the liquid from canned tuna, vegetables and any other food that comes in a can. You simply place this can colander over the opening and press to get rid of all that salty brine or unhealthy oil. Safe and easy to use, it also keeps fingers free from fishy smells and is dishwasher safe. A low price on Amazon for this helpful addition to your kitchen. Rainy Pots hang on indoor or outdoor walls and are designed to gently water your pot plants so their roots aren’t damaged and the grow stronger and happier. You fill the cute clouds above the pot plant with water and it slowly drips down like rain. It’s a simple idea that both looks good and works well. Where would you hang your Rainy Pot? Available in different colors on Amazon now. S’mores, everyone’s favorite campfire treat, is now super easy to make at home in just 30 seconds. This well thought out microwave s’mores maker has two special arms to stop marshmallows from swelling too much and running or getting overcooked. It’s BPA free construction and has a water reservoir you fill to make sure that everything is evenly heated. You can also try it with crackers, cheese and ham or other savory or sweet combinations for a delicious snack in half a minute flat. A great gift at a low price on Amazon now. Is your cat feeling jealous after you got the Lion’s Mane for Dogs for Fido and he’s been strutting around the place like a king? Get Miss FluffyPaws a lionly upgrade too with this highly cute Lion’s Mane for Cats. Also great for puppies and small dogs. Just think of the photo opportunities. Many positive reviews and at a low price on Amazon to turn your kitty into the lion you know they’ve secretly always wanted to be. Also check out the Magical Unicorn Horn for Cats here. This brilliant and easy to use spiralizer will quickly become a favorite in your kitchen. With a few twists you can quickly turn whole vegetables into delicious and extremely healthy noodles. It’s perfect for adding more nutrition to any meal, without fattening grains, as well as making amazing looking and tasting salads, side serves and garnishes. A great weight loss aid and simple way to get your children to eat their veggies! Fits in your hand, BPA free and easy to operate. High quality Japanese made blades for quick slicing. A great gift for anyone who enjoys quick and healthy cooking. At a great price at Amazon with many positive reviews, users pictures and questions answered. The grid design 8 bottle countertop wine rack looks great with smooth rounded corners and seamless joints. Made of natural finish bamboo – the most sustainable and Earth-friendly wood in the world. Multiple units can stack together for serious wine aficionados and it comes fully assembled and ready to use. 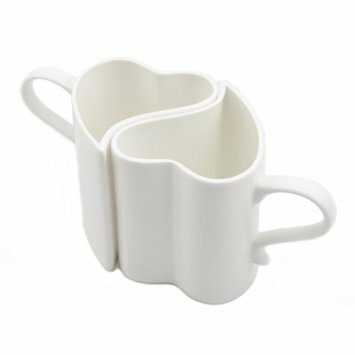 An artistic look for your own kitchen or a stylish gift for classy friends. More pictures and details on Amazon. Inspire someone you care about to “Be Awesome” with this beautiful and inspirational coffee mug. Printed with a dishwasher safe motivational message to get the day started off in the right frame of mind. A great gift for the right person. Check the price and see more reviews on Amazon. The unique Nordic Ware Egg Waffle Iron creates delicious puffy egg waffles that are crispy on the outside and melt in the mouth soft on the inside. This specially designed and USA made waffle pan has a rugged construction and PFOA-free nonstick cooking surface for stick-free release of your waffles. The hinged and interlocking waffle pans separate for easy cleanup whenever you make up these amazing waffles for breakfast or brunch. Waffle mixture recipe included and a 10 year warranty. An unusual gift idea or just a great addition to your kitchen, the Nordic Ware Egg Waffle Maker is available at Amazon here. If you like a good campfire or Winter fireplace then you’ll love Magical Flames. Just throw a packet or two into a campfire, fire pit or fireplace and watch the flames turn brilliant greens, blues, reds and purples! It really does look like magic and you can enjoy the beautiful colored flames for up to 3 hours. You can create this amazing mystical fire in any wood burning fire, both indoors and outdoors. Great for camping trips and family gatherings like Thanksgiving and Christmas. Read more about Magical Flames and see people’s pictures of what to expect here. Project the ocean onto the ceiling above you while playing your favorite music. This Ocean Wave Night Light Projector rotates through beautiful waves of blue, red, green lights and stunning multicolors. You can set it the one you like the best or just let it create ever changing patterns on any surface you point it at. You can plug in an iPod, smartphone or other device that plays music with an audio jack and play it through the Ocean Wave’s built in speaker. It has an automatic shut off after one hour so you can go to sleep with it on and it will shut down on it’s own. Fascinating for children and perfect whenever you want to relax in the bedroom, lounge room or bathroom with calming, rolling waves. A great gift but one you’ll probably want to keep for yourself once you try it. Read the specs and check the price of this bestseller, with customer reviews and pictures and videos from inside people’s homes here. Carnivores rejoice! The Butcher’s Kitchen Impressor will transform your meat eating experience forever. The Impressor’s 60 pinpoint blades slice into meat to both tenderize it and deliver marinades deep into your steak or chicken. The result is an incredibly tender and tasty meat that cuts marinating time from hours to minutes and cuts down cooking time by up to 40%. Chrome-plated zinc construction and dishwasher safe, the impressive Butcher’s Kitchen Impressor also comes with interchangeable smooth and course pounding plate for flattening meat, cracking seafood, crushing nuts and garlic and much more. Love icecream but working on your figure? Kids bugging you for expensive cones from the icecream man? Perhaps you’re lactose intolerant and dairy doesn’t sit well with you. Here’s the healthy solution to all of these problems. This Homemade Healthy ‘Icecream’ Maker takes regular fruit like bananas, berries, papaya, melon and mangoes and turns them into delicious frozen treats. No added sugar, no dairy, no running to the shops and a big money saver. 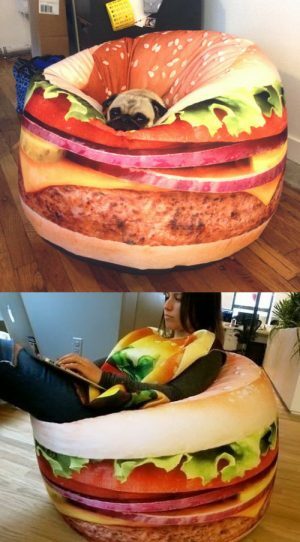 A great gift idea and likely to be a big hit in the kitchen. See the many reviews on Amazon for much more on how to make healthier homemade ice cream here. Tired of cork in your wine glass or crushing your fingers as you try to open your wine bottle with the old waiter’s ‘friend’? Make struggling with wine corks a thing of the past with this sleek and sophisticated Electric Wine Bottle Opener. Designed to fit all regular wine bottles, this handy device looks great and will effortlessly open your favorite red or white (even rose if you insist) in a matter of seconds. The cordless electric bottle opener has a foil cutter for easily removing seals, a comfortable soft grip handle, simple push-button operation that quickly pulls out any wine cork, a minimalist recharging base and opens up to 30 wine bottles on a single charge. This stylish wine opener comes in 3 metallic colors and even has classy packaging making it a great gift for any dedicated wine snob. The number 1 best seller in Electric Wine Bottle Openers with good reason. Check out the detailed description, extra pictures and the many positive reviews here. Normal clocks are so boring they’d be better melted. So someone did! 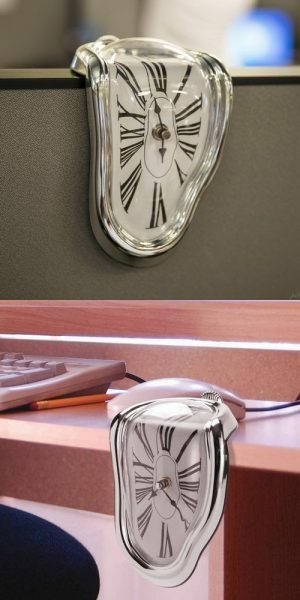 The melting clock’s angled design adds to the effect and instead of hanging it on the wall you place it on a counter, windowsill, bookcase, shelf or desk so that it seems like it’s slipping off the edge. In fact 2 supporting pegs on the back of the clock help keep it sitting pretty and it’s actually very stable. This unique gift brightens up any kitchen, bedroom, living room or office and is sure to get more than a few comments. Do you know anyone who’d like this as a gift or would you keep it for yourself? See the Melted Clock here. As smartphones and especially tablets have grown in popularity so have ways to use them without having to constantly hold onto them. The best of these have a bendable gooseneck and an adjustable holder for all kinds of smartphones and tablets like iPads. Unlike some others, this gooseneck device holder has a soft silicone grip to protect against scratching and it can fit any smartphone or tablet up to 10.1 inches. The sturdy base attaches securely to virtually any desk, shelf, bookcase or bench and you can have your device at any angle and even rotate it a full 360 degrees. Use it to follow recipes while cooking, watch movies or read in bed, capture videos or talk on skype, anything you can use your phone or tablet for that would be much easier hands-free! Get the full specs, read the reviews and see people’s pics and even videos of the Gooseneck Smartphone & Tablet Holder here. This picture frame is alive! It come pre-populated with a variety of beautiful, yet hardy succulent plants. They are very low maintenance, rarely need water and can thrive in both shade & sun. Hang it inside on any wall, outside on a balcony where space is at a premium or as a centerpiece on any table. 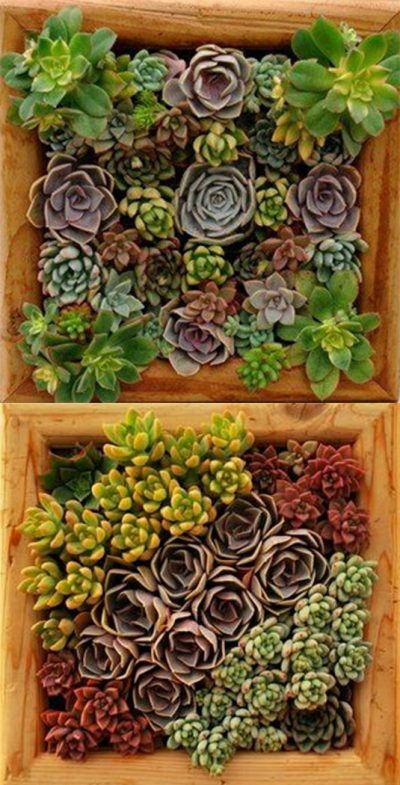 This living wall feature comes with the succulents already growing and makes for a unique and beautiful gift your friend will think of every time they see it.